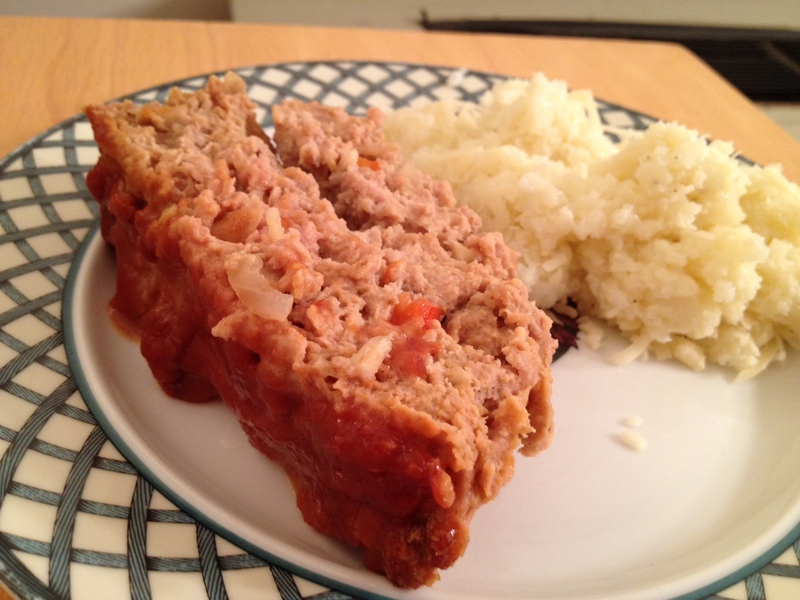 Growing up, the ultimate in comfort food for me was my mom’s meatloaf and mashed potatoes. I always ask my mom to recreate it for me when I go home, but I also make it for myself often, normally adding a healthy spin to it. By replacing the ground beef with lean, ground turkey, adding fresh veggies to the meatloaf, and replacing the mashed potatoes with mashed cauliflower (it’s really yummy, trust me! ), I cut out extra fat/cholesterol from the ground beef and add 2-3 extra servings of veggies. The original recipe my mom created is adapted from a Lipton soup recipe. She puts a delicious ketchup/Dijon mustard/brown sugar sauce on top of the meatloaf which gives it an awesome savory/sweet flavor that is a hallmark of Southern cooking. I’ve included both recipes below so you can try out either depending on your mood. Enjoy! Disclaimer: Meatloaf is not a “pretty” looking dish. This version tastes GREAT though! 2. In large bowl, combine all ingredients for the meatloaf. Place in baking dish. 3. In a small bowl, combine all ingredients for the sauce and put mixture on top of meatloaf. 2. Using a hand mixer or blender, blend cauliflower until smooth and creamy. 3. Add parmesan cheese, butter or margarine and salt & pepper, to taste. The less cheese and butter you put in, the healthier this dish with be, so start slow! 4. If the mashed cauliflower is too thick, add some skim milk to the mixture to thin it out a bit and make it creamier.